This was an annual competition in medieval Ferrara, Italy. It was held on June 24th, Saint John's day. 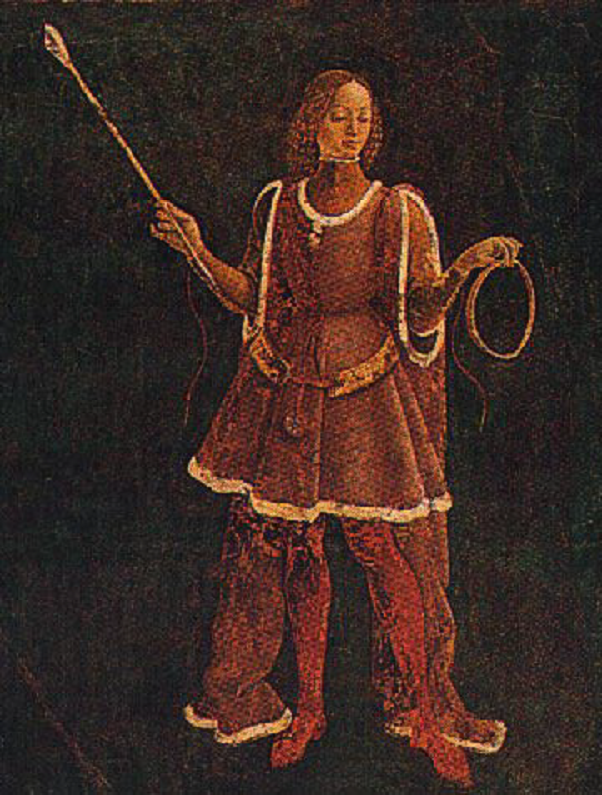 Some detail is found in the frescoes in the Schifanoia Palace. The target was a series of wooden rings, similar in appearance to embroidery hoops, of decreasing diameter. The distance to the target is not known. The painting to the left shows an archer holding one of the rings. Each archer would loose three arrows at the ring. If at least one arrow did not strike within the ring, the archer was eliminated from the competition. When all the archers had shot, the ring was removed and replaced by a smaller ring. This continued until only the winner remained. 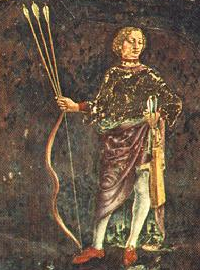 The second painting shows an archer from the competition with his three arrows. Note the recurve bow. To use this for a SCA competition the target can be set up between twenty and twenty five yards, or further, without announcing the actual distance to the archers. The rings, which can be found at craft stores, can be approximately 4, 6, 8, 10, 12 etc. inches in diameter. The rings should be of a color to be easily visible against their background. You start shooting at the largest ring. Depending upon the number of archers shooting, they may shoot all at once or in groups. After all have shot, the scores are recorded and those archers that did not have any arrows within the ring are eliminated. Only arrows within the ring count as a hit. That ring is now removed and the next smaller ring hung in its place. This continues until all remaining archers have shot at the smallest ring. If several archers remain after the smallest ring has been shot, they will shoot once more and the archer that strikes closest to the center of the ring wins. If needed, the next closest archers may take second, third, etc. place. If points are needed as part of an overall competition, you may give one or more points for each arrow within the ring. The number of rings used can vary depending upon how long you want the competition to last. For example, for a stand-alone competition you might use six rings and for one that is part of a larger competition you could use three. This article is for the use of the members of the Society for Creative Anachronism. The author gives his permission for it to be reprinted or to be put on web sites by members for their use, as long as proper credit is given to the author.